Hello! Welcome to the Taylored Expressions February Sneak Peek Day Two! This is our Easter release, and I know you are going to love all of the new stamps and dies! For my final project, I created a 6x4 card for my Project Life album for this week. 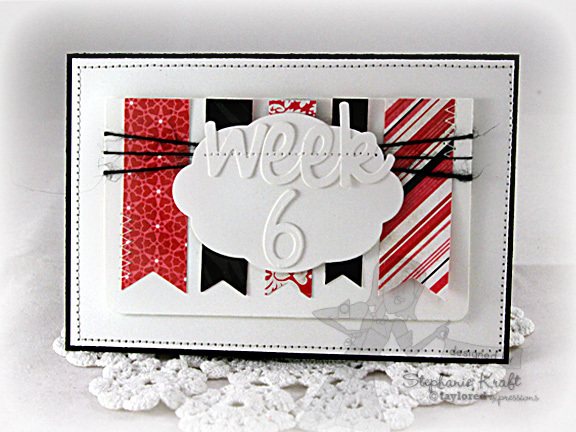 I used the new Whimsy Alpha and Whimsy #'s to create week 6. 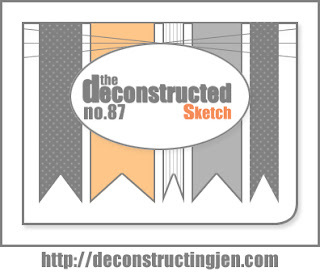 I used Jen's Deconstructed Sketch #87 for my layout. This will be my title card for the week, and it coordinates with another 6x4 card that I made, HERE. Accessories: Taylored Dies: Banner Stacklets 1, Label Stacklets 1, Circle Cutting Plate, Floral Cutting Plate (Taylored Expressions); Chino pearls (Kaisercraft), Foam tape, Thread, Sewing machine. Accessories: Taylored Dies: Whimsy Alpha, Whimsy #'s, Banner Stacklets 1, Take Note Frame 1 (Taylored Expressions); ¼” Round-it-All (Zutter), Black twine (May Arts), Foam tape, Thread, Sewing machine. Wow! 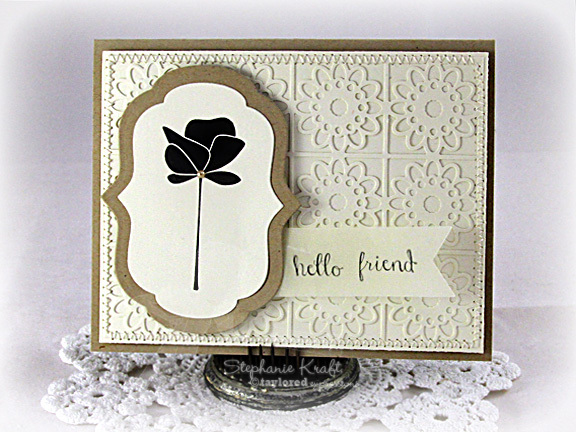 I would never think to stamp flower silhouettes in black, but you have convinced me. These are just stunning! That is such a striking card set! And I love the white on white for your little title block too. This is just amazing! 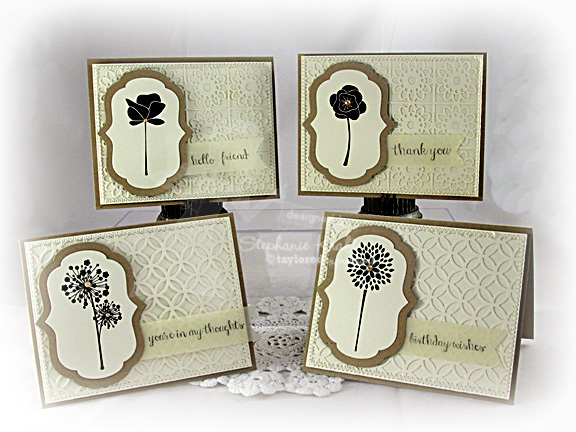 I love the wonderful images and how you used neutral colors for these gorgeous cards. Gorgeous cards! I love the elegance of the set and the colors on the week 6 card are stunning. 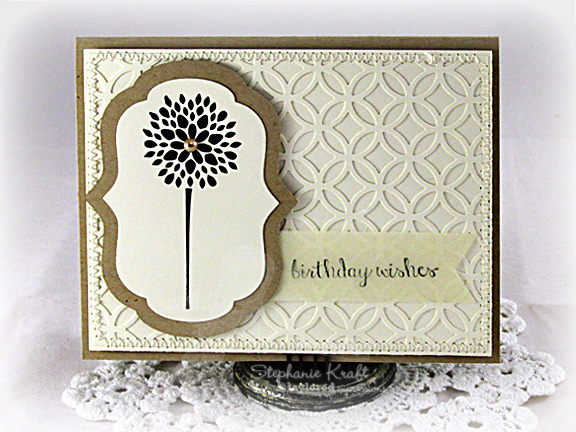 Your card set is so beautiful and elegant, Stephanie! I just love the black flowers with the pearls against the layered white backgrounds. Your project life card is fabulous! Those backgrounds are beautiful and I LOVE the neutral colors! Gorgeous cards!!! Look at those cutting plates - eeek! And love that alphabet for PL!!!! Can't wait to get it!!! Beautiful card set with the elegant color combo and beautiful backgrounds!